Following an opening weekend which featured a sold-out opening night, The Impresario from Smyrna, Anderson Theatre’s season finale, presents its final two performances May 8 at 8:00 p.m. and May 9 at 2:00 p.m. The Impresario’s performances lived up to its billing as a laugh-out-loud comedy and parody on the life of the artist in 18th Century Venice. From the script adapted by Director Henry MacCarthy, to the acting, the costumes, make-up and set, The Impresario from Smyrna is a “prima” extravaganza that delights the audience from the opening insult to the final twist of the knife. 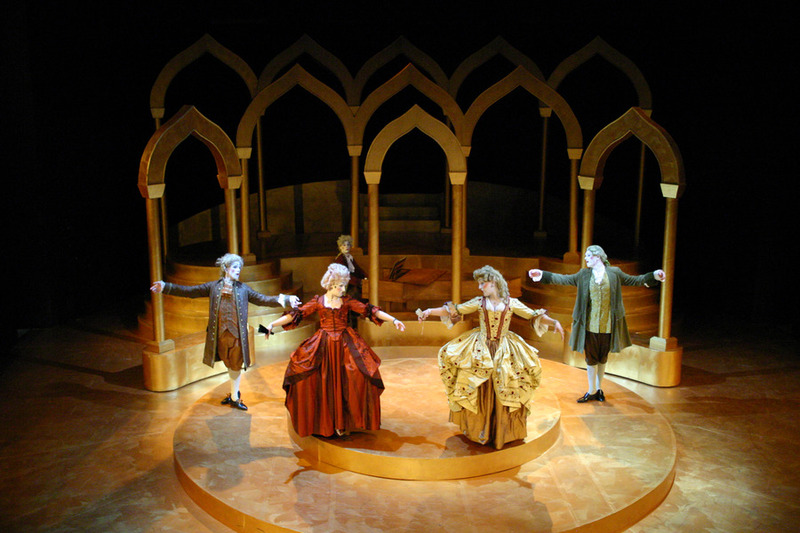 Carlo Goldoni’s comedy/farce, The Impresario From Smyrna, directed by Henry MacCarthy, will close the Anderson Theatre season with two performances this weekend in Anderson Theatre, Friday, May 8 at 8:00 and Saturday, May 9 at 2:00 p.m.
First produced in Venice in 1761, The Impresario From Smyrna is a laugh-out-loud comedy following the antics of a group of self-absorbed, avaricious, naive and manipulative musicians, agents and benefactors in Venice in the 18th Century. At the same time, subtly, it parodies the opera and theatre stages of the era. From the opening act, the audience has front row seats to this hilarious inside look at behind-the-scene rivalry, jealousy, diva fits, casting couches and audition gossip. And yet, The Impresario From Smyrna is also about the beautiful vulnerability of the romanticized artistic personae that surrounds stage life. In brief, it’s everything we love and love to hate about the theatre. It is a special treat to have this play as a part of the season at Gustavus as it is rarely performed. The script is a version specially adapted by MacCarthy based on an English translation by Clifford Bax, a Spanish translation by Orlando Arocha, and the original text by Carlo Goldoni. With period costumes designed by Andrea Gross, set design by Micah Maatman and lighting design by senior theatre major Dana Rabe, the audience is drawn into a truly magical theatre experience. Working with a piece such as this is a great learning opportunity for the students involved. Not only do they have to perform a period piece, but they are also acting as “performers” and investigating the medium of theatre itself. Students must also sing as part of this production. J. Gawff, music director of Opera Omaha was in residence at Gustavus to work with the actors on the ensemble numbers. In addition, Heather K Fleming, Wig Master for The Actors Theatre of Louisville, designed the wigs worn by the entire cast. The talented cast has taken on all of these challenges and risen to the occasion, audiences are sure to be pleased. Tickets for The Impresario From Smyrna are available through the Gustavus Ticket Center at (507) 933-7590. Adult tickets $7.00, student and senior citizen tickets $5.00, Gustavus students and staff free of charge. Tickets not purchased in advance may be purchased at the Anderson Theatre Box Office beginning one hour prior to curtain.